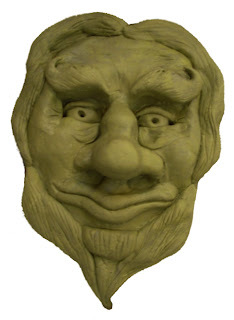 He is by no means finished, but this is a work in progress shot of the wall mounted leprechaun face I have been working on. Milliput is difficult to manipulate but necessary in this instance as the piece will be living outdoors. It's quite tricky to actually define a Leprechaun as everyone has a slightly different idea about how they look! However, this is my visualisation. OMG that is amazing - what size is he? Hi! Thankyou very much! He is about 5 1/2 inches tall at the moment!